Welcome to Camping Fontanelle Moniga del Garda. Camping Fontanelle is in a peaceful location on the shores of Lake Garda. Our campsite covers an area of 45,000 sq mt, is well shaded by olive trees and has a beautiful 450 meters long beach with a view of Sirmione. The nearby historical village Moniga del Garda is very friendly and offers a tasty selection of restaurants. All the campsite facilities have been recently modernised and improved, offering new and well maintained washing facilities with free hot water, washing machines and dryers. In addition there is mooring and a slipway for boats, a well stocked shop and the facility to change money. Many fun activities are available watersports, swimming, tennis, children's play area, or you can relax and enjoy the sunshine at our large pool. A delightful Pizzeria is also on site overlooking the panoramic Lake Garda. The campsite offers an ideal setting for tents due to the large, shady pitches. Brick bungalows are also available to rent, fully furnished with all necessities. Camping Fontanelle is a friendly campsite where all our staff speak fluent English. We look forward to welcoming you to one of the most beautiful areas of Lake Garda. 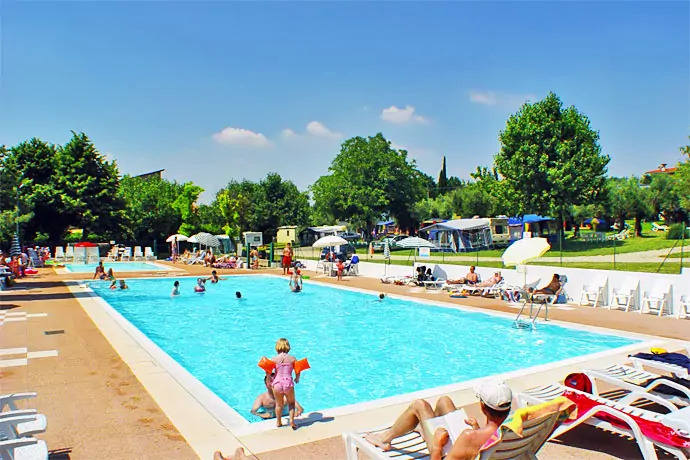 (Camping Fontanelle Moniga del Garda campings).